The space station design was unveiled on a live broadcast to celebrate the Chinese New Year. China isaggressively accelerating the pace of its manned space program by developing a17,000 lb. man-tended military space laboratory planned for launch by late2010. The mission will coincide with a halt in U.S. manned flight withphase-out of the shuttle. The projectis being led by the General Armaments Department of the People's LiberationArmy, and gives the Chinese two separate stationdevelopment programs. Shenzhou 8,the first mission to the outpost in early 2011 will be flown unmanned to testrobotic docking systems. Subsequent missions will be manned to utilize the newpressurized module capabilities of the Tiangong outpost. Importantly,China is openly acknowledging that the new Tiangong outpost willinvolve military space operations and technology development. Also thefact it has been given a No. 1 numerical designation indicates that China maybuild more than one such military space laboratory in the coming years. "ThePeople's Liberation Army's General Armament Department aims to finish systemsfor the Tiangong-1 mission this year," says an official Chinese governmentstatement on the new project. Work on a ground prototype is nearly finished. The design,revealed to the Chinese during a nationally televised Chinese New Yearbroadcast, includes a large module with docking system making up the forwardhalf of the vehicle and a service module section with solar arrays andpropellant tanks making up the aft. The conceptis similar to manned concepts for Europe's AutomatedTransfer Vehicle. While usedas a target to build Chinesedocking and habitation experience, the vehicle's military mission has someapparent parallels with the U.S. Air Force Manned Orbiting Laboratory (MOL)program cancelled in 1969 before it flew any manned missions. MOL's objectiveswere primarily reconnaissance and technology development. While U.S.military astronauts were to be launched in a Gemini spacecraft atop their MOLs,in China's case, the module will operate autonomously and be visitedperiodically by Chinese astronauts, to perhaps retrieve reconnaissance imageryor other sensor data. At least one unmanned Shenzhou was equippedwith a military space intelligence eavesdropping antenna array. Along withlaunch of the outpost, China is also beginning mass production of Shenzhoutaxi spacecraft, says Zhang Bainan,the chief Shenzhoudesign manager. All previousShenzhoushave been built as individual custom spacecraft for widely spaced missions.But China is now moving to Shenzhouassembly line production to increase flight rates. In additionto operational mission objectives the Chinese mission plans will provide apropaganda windfall in China and send a global geopolitical message relative todeclining U.S. space leadership. The Tiangongvehicle's debut in late 2010, and increase in Chinese manned mission flightrates will coincide with the planned termination of the U.S. space shuttleprogram and a five year hiatus in American manned space launches. The firstmanned NASA Orion/Ares manned mission to Earth orbit is not likely until 2015with manned lunar operations no earlier than 2020. During thatperiod China can rack up multiple attention getting missions, while Americanslaunched in the Russian Soyuz will draw meager attention unless they areinvolved in an emergency. Along withthe Tiangongannouncement comes another major revelation ? that China now has two mannedspace station programs under development.
? The new Tiangongseries, that can be launched on the same type Long March 2F booster used tocarry Soyuz-type Shenzhoumanned transports.
? And alarger 20-25 ton "Mir class" station that will follow by about 2020launched on the new oxygen/hydrogen powered Long March 5 boosters. The Chinesehave shown this editor numerous space station models and drawings during sixtrips to China over the last several years. All of thoseconcepts looked very similar to the Soviet Mir with a core and add-on modules--nothing like the Tiangongjust revealed in China. The heavierMir type design, however, is the one being pursued for launch on the new LongMarch 5, Liu Fang, vice president of China Aerospace Science and TechnologyCorp. (CASC) told me during a visit to Beijing last April. It will weigh twiceas much as the man tended military outpost. The Tiangongdesign is designed for short tasks or limited overnight stays in a pressurizedshirtsleeve environment, while the heavier Chinese stations planned for severalyears from now will be for longer term habitation. In additionto the manned program, the Chinese unmanned programhas also reached a major milestone with the Chang'e lunar orbiter. Thespacecraft ended its 16 month science mission March 1 when commanded to firethrusters to begin a 36 min. descent toward lunar impact at 0813 GMT. The impactpoint was calculated to be at 1.50 deg. south latitude and 52.36 deg. eastlongitude. onthe opposite side of the Moon from where the descent was begun. Chang'e-1began its retrofire maneuver for capture by lunar gravity at 0736 GMT under thecommand of two ground control stations, one at Qingdao in eastern Chinaand the other at Kashiin northwest China. 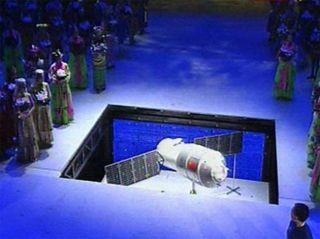 Thespacecraft had been launched from Xichang on board a Long March 3 on October24, 2007 and used its imaging system to obtain mapping imagery of the entiremoon. It was commanddeorbitedto provide Chinese engineers with experience in calculating and controlling thedescent of a spacecraft in lunar orbit. Lunar "masscons",subsurface concentrations of heavy materials, can affect lunar gravity fieldsand orbital trajectories involved in deorbit. This relatesdirectly to China's follow on plan to land a nuclear powered unmanned lunarrover by 2012-2013 followed by an unmanned sample return mission about 2017. In2010-2011, before the rover and sample return missions are flown aChinese-technology mission may be sent to the Moon to further demonstratelanding technologies. But the Chinese were not clear on whether it would go allthe way to the surface. Ifsuccessful, these missions also could upstage U.S. lunar plans for a time.